In-line inspection of pipelines is a routine procedure today. Specialised automated tools are introduced and pumped through the oil, product or gas line to be inspected. Dr Michael Beller reports. 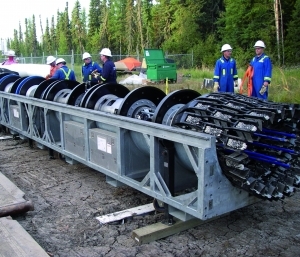 Depending on the types of anomalies and flaws to be detected, a variety of non-destructive testing methods can be applied for in-line inspection of pipelines. One such method is ultrasound (UT). - Inspection of ferritic and austenitic steels. - Highest level of accuracy. - Data quality ideally suited for integrity assessment and fitness-for-purpose studies. - Capable of detecting and sizing metal loss, crack features and mid wall anomalies. A major advantage of ultrasound technology regarding integrity assessment is its capability to perform true quantitative wall thickness measurement, achieving resolutions of better than 0.1 mm and accuracies of +/- 0.4 mm. Ultrasound tools can thus be used to verify and record the actual wall thickness for any location within the pipe. Data which is of particular use in case of a pipeline uprating process. The accuracy incorporated in ultrasound also provides advantages regarding run comparisons and corrosion growth studies and the use of advanced integrity assessment codes such as DNV RP-F101. Modern UT tools make use of a modular approach. This philosophy applies to the mechanical as well as the electronics design. In short it can be stated that there is basically a single tool which can be configured for a large variety of inspection tasks, covering all pipe sizes from 6-in to 56-in. Ultrasound technology is also the only non-destructive testing technique for reliably detecting and sizing cracks in pipelines, such as stress corrosion cracking, fatigue cracks or cracks in the vicinity of the longitudinal or girth weld. It is important to note, that cracks can appear in a variety of geometries and also orientations within the pipe wall. In addition to axial cracks, at right angles to the hoop stresses, cracks can also appear in a circumferential or even spiral orientation. The former could be due to anomalies within the girth weld and being exposed to stresses caused by bending forces, the latter due to anomalies in the heat affected zone of a spirally welded pipe. 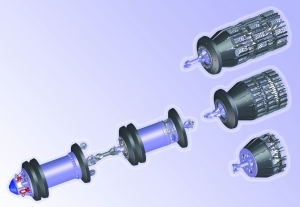 Tools are available in a range of configurations optimised for the specific inspection requirement such as metal loss and corrosion inspection, pitting inspection, axial or circumferential crack inspection, combined inspection, bi-directional use as well as the inspection of high temperature and high pressure pipelines. Ultrasound tools are also capable of combining inspection tasks, such as metal loss and crack inspection.